In Latin, fetus means offspring. The word is commonly used for an unborn baby at all stages of intrauterine growth. However, it is the ninth week post conception, when the fetal stage actually starts. 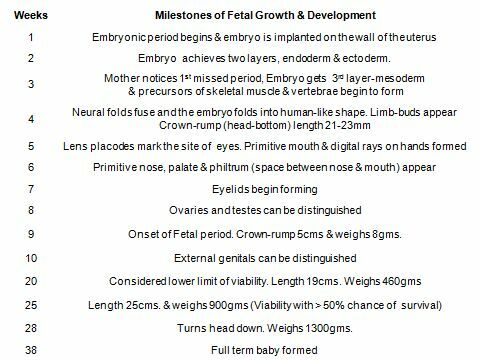 The first eight weeks are divided into pre-embryonal and embryonal stages. Sequential changes in the fertilized egg form well differentiated tissues and organs of a human embryo. Growth and maturation of cells are determined by the inherited genetic potential. Maternal provision of nutrition and placental transfer of these nutrients to the developing baby, helps the baby bloom to its full potential. During the second week after conception, the embryo gets fixed to the uterine wall. At this time many women experience some amount of spotting, which is often mistaken for scanty menstruation bleed. By the end of the first trimester the foundation the major organs is laid in the embryo, which now begins to take the human form. Click here to watch a little video clip. The second trimester marks the onset of fetal stage, when structural remoulding of the organs occurs. The number of cells in the organs gradually increases. These cells are now larger and functional, thus increasing the organs' performance as well. By the onset of third trimester the baby is fully formed. The third trimester is the period of maturation. During this period fetus triples its weight and doubles its length. It also accumulates protein, fat, glycogen iron and calcium stores. It is noteworthy that the first two trimesters are the formative phase. Untoward influences during the first 6-7 mo. of pregnancy often prove disastrous for fetal development. During this phase, a growing embryo is highly susceptible to development of metabolic disorders. Risk of birth defects is markedly aggravated under the influence of external toxins: alcohol, caffeine and secondhand smoke. Theoretically the lower limits of viability of baby outside mother’s womb is 5 months (20 weeks) of gestational age onward; and minimum birth weight of 500 grams. Though few fetuses born at 21 weeks of gestation have survived, it is extremely rare. The lower limits of fetal survival are of great concern when the question of opted abortion sets in. Till date, there are no defined cutoff limits of intrauterine development, age, or weight at which a baby automatically becomes viable. The best of neonatal intensive care centers prefer that baby attains minimum 23 weeks of gestational age to qualify for intensive care. Most of the recent studies show about 50% survival rate in preterm babies born at 24 weeks gestational age. Thus the fetal viability is now considered to be 24 weeks of gestational age. The risk of brain damage and developmental delay is high in the survivors of these extremely immature preterm neonates. Many of the survivors of premature births die by their first birthday. Among the ones that reach school age, 80% suffer from long term moderate to severe disabilities such as cerebral palsy, vision or hearing loss and learning problems. The main cause of this high perinatal mortality and morbidity is immaturity of the respiratory and the central nervous systems seen at an early intrauterine age. The outcome improves remarkably from 27th week of fetal maturity, survival rate being 90% and long term morbidity at its minimum. Note the rapid fetal growth pattern after first 6 months of pregnancy. Variations are a common phenomenon and are usually well tolerated by the growing fetus. Many external and internal factors cause the variations. They have three major origins. Fetal growth determines the final outcome in a neonate. Depending on baby's duration of growth in mother’s womb. Premature: A fetus who is born before completing the intrauterine growth of 37 weeks duration. These babies are at risk of perinatal complications and long term disabilities. Full term: Completed minimum 37 weeks intrauterine growth period. Period of onset of 38th week to completion of 42nd week is considered to be normal full term gestation. Postmature: If fetus is not born even after completion of 42 weeks of gestation. Continue reading. There is a lot more on "Fetus"
Unborn 34 weeks baby is 30 cm long.Is it normal?